Wildlife safaris are the best way to explore Indian wildlife, the most famous way of wildlife safaris in India are Jeep Safari and Elephant safari. Below are the details of the parks where you can safaris in India. Elephants safaris in india is used for tiger tracking, Elephant can take to the visitors to the places where jeeps can not go. The chances to tiger sightseeing is more on Elephant Back. Elephant safaris in india are organized at Bandhavgarh National Park,Corbett National Park, Kanha National Park, Kaziranga National Park, Manhas National Park, Nagarhole National Parks. Jeep safaris tours organized by us are the best way to discover some of India's less accessible places,Jeep is a sturdy vehicle and can travel on rough and tough terrain. 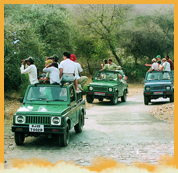 Jeep safaris are mainly to explore the jungles, Deserts and Famous Indian Himalayas. that are best reached in jeeps. The most famous Manali route is one of the best example of Jeep safaris in India.